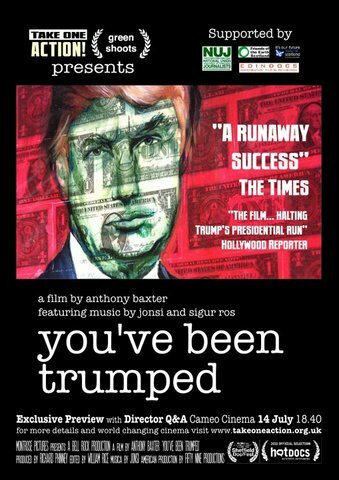 I don’t think I’ve wanted to like a documentary more this year than You’ve Been Trumped. It’s got everything you could want in a populist documentary: Adorable Scottish Farmers Vs. Terrible Soul Sucking Villain in a battle for the future of Scotland. Sounds like a slam dunk, right? Ummm…well….not so much. It’s not that Anthony Baxter didn’t have a compelling subject. The film focuses on the battle between batshit crazy billionaire Donald Trump, and batshit crazy Scottish farmer/fisher Michael Forbes. Trump is building a huge golf course in Aberdeenshire, Scotland, against the wishes of some of the local residents, and in the process uses bullying tactics that would give Biff Tannen pause. Sounds like a great concept for a documentary, and it is. It’s a nice starting spot, but ultimately a documentary that takes a side in a conflict needs to make it’s case, and You’ve Been Trumped never entirely does that. There are a few talking heads thrown in at the end that weigh in on the environmental and economic concerns about the project, but neither are given enough time or context to really prove their point. Instead, Baxter attempts to play on our emotions, using shot after shot of disgruntled homeowners shaking their heads in disgust, with a healthy dose of scenes from my wife’s favourite movie, Local Hero, thrown in. On an emotional level, it works, as Trump is incredibly easy to hate, especially after his brief foray into presidential politics this summer. But from a factual standpoint, this film is weak on the one thing a documentary like this needs: A strong argument. Miss Bala is what would happen if Miss Congeniality and Traffic had a movie baby together. Beauty pageant movies and Mexican narco-dramas might not be the most obvious genres to match up, but somehow Gerardo Naranjo makes it work. Our heroine here is Laura, a young woman from Tijuana that wants nothing more than to win a local beauty pageant, and be crowned Miss Baja California. She seems well on her way, until her and her best friend stumble into a raid on a local nightclub by a famed narco gang. Although she attempts to extricate herself from the mess quickly, her actions only serve to make things worse, and she becomes deeply involved in a vicious drug war. It’s a strong premise, and one that’s timely for anyone with a passing knowledge of what’s been happening in recent years in Mexican border towns. And in Stephanie Sigman, we have a vivacious and charismatic lead. Then why didn’t I enjoy this movie more? Naranjo pulls no punches here. He spends as much time as possible making sure we experience every horrible minute of Laura’s ordeal, complete with loooong tracking shots, close-ups that seem to go on for hours, and a lead character more sympathetic than a cancer ridden puppy. But in trying to hammer us over the head with the seriousness of Laura’s situation, Naranjo forgets to actually make an entertaining thriller. There are no highs and lows in this movie, just scene after scene of a passive lead stumbling into terrible scenario after terrible scenario, and it doesn’t take long for the movie to be crushed under the weight of its own gravitas. This entry was posted in Movies and tagged Donald Trump, VIFF. Bookmark the permalink.